So how was the band conceived? The band was created officially back in 2015 by me as a project to kind of highlight up and coming Swedish musicians. After the success of the first single 'Never Too Late' in 2016 I knew that I wanted this to become so much more than a studio band and officially started looking for full-time members. How did you come up with the name Creye? I was looking for a unique name that wasn't already over-used by bands and I had narrowed it down to three names that I felt were strong. When I presented them to the logo designer he simply presented me with an additional name for the list, Creye. The name was a play on the words "Cry" and "Eye" and I simply liked it straight away and decided to go with it. The album is a superb slice of Swedish Melodic Rock. Who were your musical influences, as it has a distinct eighties feel to it? First of all thank you for the compliment! There are of course quite a few: H.e.a.t, Giant, Work Of Art, Survivor and FM would definitely be at the top of a very long list. One of the highlights of the album, for me, are the vocals of Robin Jidhed. A new name to me, so where did you find him and is he related to Alien frontman Jim Jidhed? Robin was found by our manager after a long period of searching for a permanent frontman for the band. And yes, haha, he's the son of Jim Jidhed. The album has been on non-stop rotation with me; you must be pleased with it? Did you write all of the tracks or were outside writers used? Very happy to hear that! We are extremely pleased with it of course and couldn't be more eager to get it out there for the world to enjoy. There were two tracks that were written entirely by external writers. One is a co-write with me and Erik Wiss (Producer) and one with Ulrick Lönnqvist (Code Red). The rest of the songs are written by me or Fredrik in the band. One of my favourite tracks on the album is 'Christina'. Is this song about a real life lady called Christina? This was one of the songs that was entirely written by external writers (Mike Palace & Sören Kronqvist). I've asked Sören about it and he doesn't know either, haha. When the lyric video was made by Wayne Joyner he portrayed Christina as a car, which was a twist that we absolutely loved. It's up to the listener to interpret it I guess. Change the name and I think it's a story that most people could relate to. 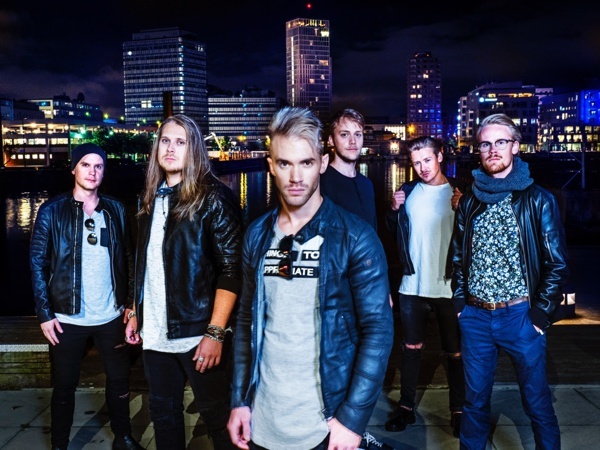 You recently made your live debut at Melodic Rock Fest Sweden. How was that experience? It was a great experience for sure! It went as great as a live debut could possibly go. I mean there we were with a whole show of songs that nobody had ever heard before —except for the EP songs and Holding on — and still we had a whole room filled with people screaming and shouting Creye, singing along whenever they could. What an amazing welcome from the audience! Are there plans for any more live shows? I know you are playing in the UK at Rockingham in October? Are you looking forward to playing in the UK for the first time? We are of course always working hard on getting more gigs to continue expanding Creye but nothing that is ready to be released officially yet. We are, as mentioned, playing Rockingham in October, which we are really looking forward to —the first time ever playing in England for us. That show will be extremely exclusive as well since we are having our producer Erik Wiss joining us on stage playing keyboards. As well as producing our album, Erik played keyboards on the first single 'Never Too Late' as well. I'm not ready to bet my life on it but this will for sure be a very rare and unique experience. The week before we're playing the Frontiers Rock Sweden event in Stockholm together with all our amazing Scandinavian label buddies. This might in some ways be considered our unofficial release party as we are releasing the album the day before, haha. It's a real coup to have your debut album released by Frontiers, one of the leading Melodic Rock labels. How did they get to sign you and wwhat's in been like working with a top label? Frontiers was one of many labels to offer us a contract after the success of the EP in 2017. But we immediately felt that Frontiers was the only label with big enough ambitions for Creye to match our own future plans. So, Creye signing a multiple records deal with them was a no-brainer. Working with Frontiers have simply been amazing, they've been super supportive of us since day one so we couldn't really ask for more. Why do you think that Sweden is such a hotbed for Melodic Rock these days? Very interesting question for sure. One that we get a lot actually and It's really hard to answer it. To be honest I couldn't even begin to speculate, haha. So what is next for Creye? Next for Creye is the release of the album on October 12th and then we're focusing on the shows following. After that we're hoping that we get the opportunity to do some touring and meet all our amazing fans.